Photo by Burrill Strong. A scene from the fire at the corner of Washington and Madison streets Wednesday night. Two Chelsea firefighters received minor burn injuries while fighting a fire on the corner of Washington and Madison streets Wednesday evening that resulted in the total loss of a garage and two vehicles. In addition, there was extensive damage to a home. 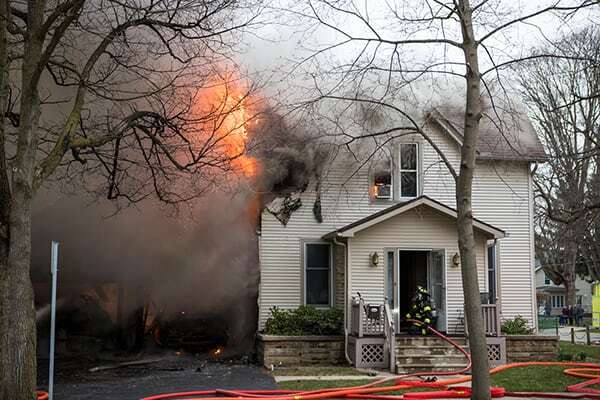 The call came in at about 6:24 p.m. said Chelsea Fire Chief Rob Arbini and when firefighters arrived on the scene, the garage was fully engulfed. He said the heat radiated to the house and neighboring garage and was aided by wind and movement of that heat. The homeowner got out safely and firefighters were able to contain the fire from jumping to the home next door. However, Arbini said there was some shingle and siding damage to that nearby structure. Arbini said the fire moved quickly due to the weather conditions and is believed to have begun with a space heater, Arbini said. He did not know the total monetary loss figures. About 25 firefighters from Chelsea, Dexter, Scio and Ann Arbor Townships were on the scene as well as HVA, city police and the utility department. HART, a disaster scene resources organization, also arrived on the scene, Arbini said, and provided water, coffee, hot chocolate and food to the firefighters. “It was a great job with exposures and saving some of the contents of the house to preserve some memories for the homeowner,” Arbini said. Firefighters were on the scene until 11:11 p.m.
I’m taken by the pic of firefighter on ladder, fire exploding from the attic. Numbed by wild TV shows/movies, one could assume all the dramatics are just there for the entertainment. No, it’s surely for real. I speak as someone with no family/friend ties to firefighters. I speak now as one in admiration of their dedication and fearless. Thank you to them all for the work they do.